My kids and I love to get into the Halloween spirit as soon as October hits. We break out the Halloween clothing and the Halloween decorations. My son even makes fun animations for his Gameband. 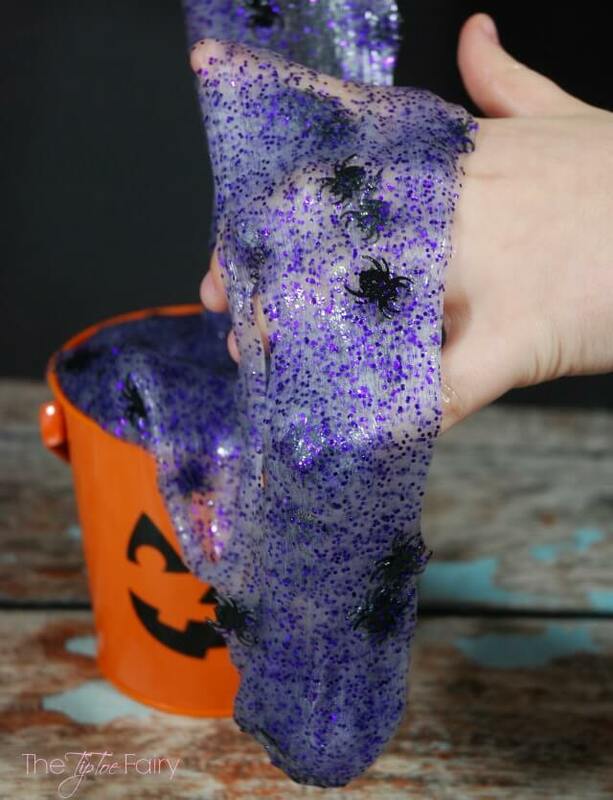 I like to make fun things to play with them like this Halloween Spider Slime. 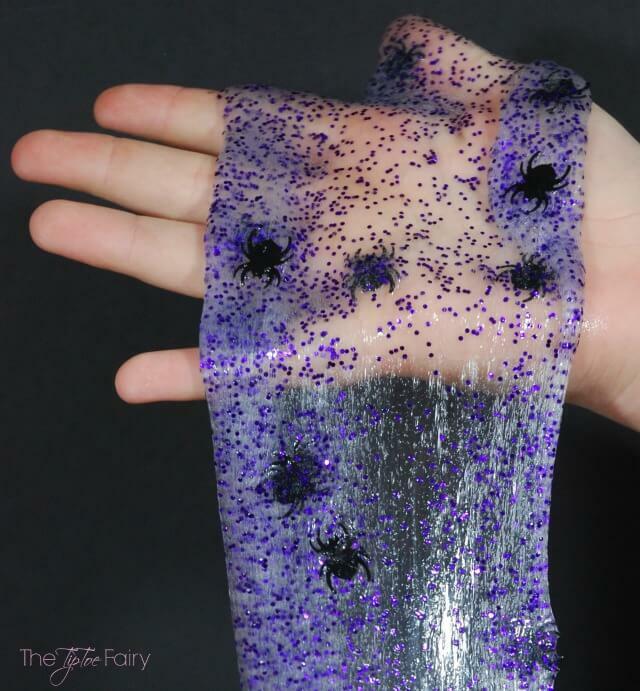 It’s full of purple glitter and confetti spiders – perfect for a creepy Halloween time. Add the water to the glue. Add the glitter and confetti spiders and stir it all up. Slowly add about half the starch to the concoction and stir. If there is still some liquid, add about half of what is left of the starch and keep stirring. When it looks like a big glob of goo (like the picture above), then stop adding liquid starch. If there’s still liquid in the bowl, then keep adding the starch a little bit at a time until it forms a glob. Once it’s too thick to stir, then start kneading the slime with your hands to work any excess water into it, so that it’s no longer sticky. Now it’s time to play! 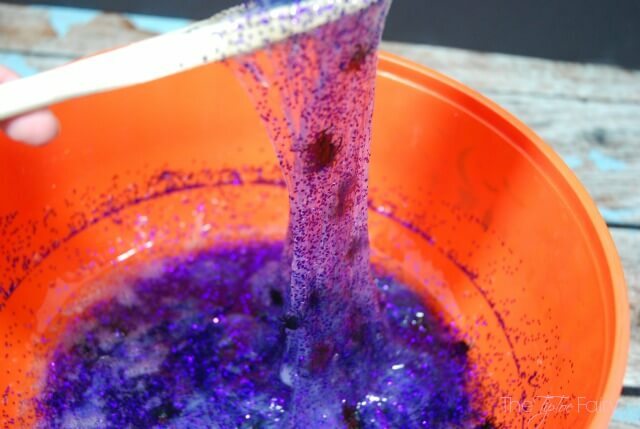 Your kids will get hours of fun from this slime. Mine love to put it in all sorts of containers and stretch it and make balls with it. It’s really so much fun — even I like to play with it! What do you do to get in the Halloween spirit? How fun is this?? 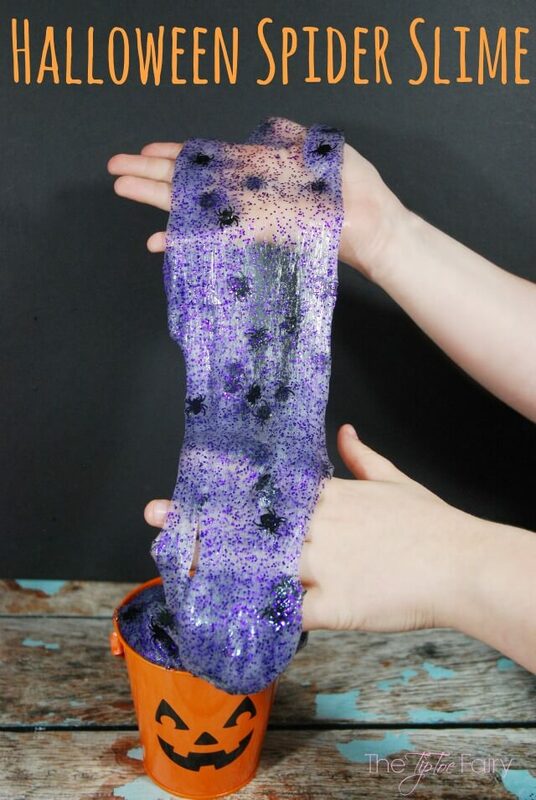 My kids would have a BLAST playing with this homemade slime! OMG my boys would absolutely LOVE this. Their Dad hates glitter…he calls it “The Devil’s Dandruff”, but we’re gonna make it anyway. Will report back on how it goes! Oh this is just the best. 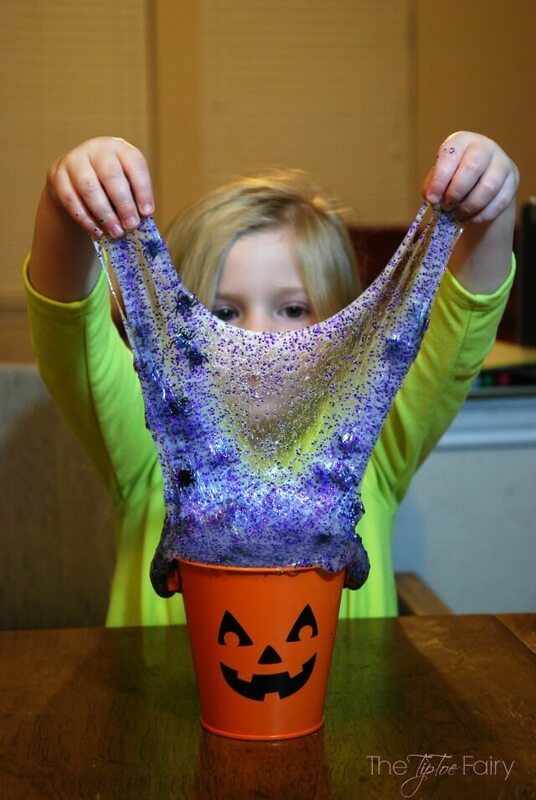 My kids always loved playing with stuff like this and I love the Halloween theme! OMG!! My 10 year old son would love to make this! Looks like a real. 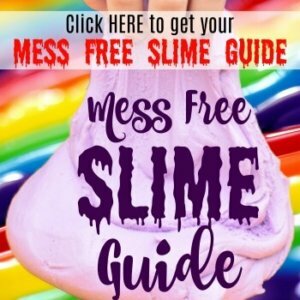 This looks like the coolest slime! 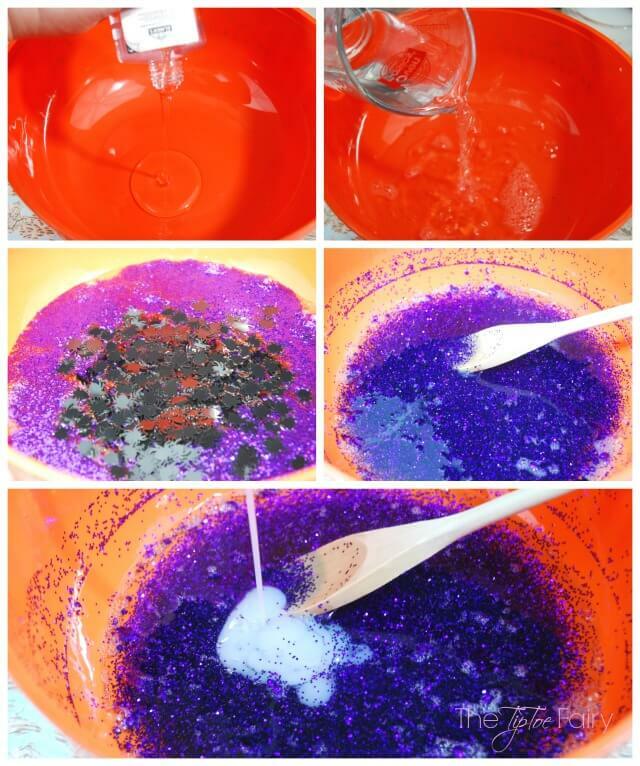 I can’t wait to make this with my toddler- she will LOVE the sensory aspect! I really like this — I think my kids would have so much fun with this. Now that is really cool. My kids would love playing with that. Thanks for the how to. It was really cool. I bet my two kids would surely love it and playing with that. What a great project for Halloween. I have to show this to my lo if he would like to do something similar. Wow! now this is creative and pretty awesome. I know for a fact my kiddos would have a blast with this! Wow my little lad would love this. I am going to make him some as a surprise when he’s at school. That’s so awesome! I bet the kids will enjoy making this. And you can use different types of confetti too. What a great activity for Halloween. I wanted to let you know that I am featuring this on http://www.simplycreativemoms.com.